UNFAMILIAR APPLES WITH UN-APPLE LIKE NAMES have been appearing in my grocery store lately. Junami. Ambrosia. Envy. Kiku. Lady Alice. Pacific Rose. Now the latest, Autumn Glory. Their flavor ranges from sweet to very sweet. Their flesh is firm to dense, ideal for shipping and storage. They are rolled out strategically for a few brief months or weeks in late winter to compete with the better-known staple varieties available continuously since the fall harvest. They have sophisticated marketing programs to promote them. New England’s apple growers are not licensed to grow them. These new apples are examples of a recent trend in apple breeding triggered by the wild success of Honeycrisp since its introduction in 1991. Developers of these trademarked varieties are hoping to replicate Honeycrisp’s meteoric rise, and forestall the potential weakening of the apple through overproduction. A good Honeycrisp is an extraordinary apple, sweet with a little tang and an explosive, juicy crunch, justifying the premium price it commands in the marketplace. Its popularity has compelled growers everywhere to begin planting Honeycrisp, despite the fact that it can be a challenging apple to grow. Honeycrisp does not store as well as some varieties, either. Its color is highly variable (from a solid reddish-pink to nearly all-yellow), and if not grown and harvested properly, its flavor can be watery or bland rather than crisp and explosive. There are many people in the industry who fear that the apple’s distinctiveness will eventually be compromised as too many Honeycrisp of uneven quality flood the market, and the premium price will suffer. The financial stakes are high. Honeycrisp produced more than $10 million in revenue for its developer, the University of Minnesota, during its 20-year patent period, making it the university’s third most successful “invention” in its history. Honeycrisp today earns growers twice as much or more than some varieties. Who can blame growers for wanting to jump on the Honeycrisp bandwagon, or the developers hoping to find the next apple superstar? TRADEMARKING NEW APPLES is seen as a way to maintain quality and avoid overproduction, and to return more money to the people and institutions that develop the fruit. The trademarked varieties are “managed” in selective “clubs,” requiring growers to pay licensing fees to grow the trademarked apple. Some of the funds collected are earmarked for marketing, and each new “brand” comes with a carefully vetted name (as you see from the above list, often having little or nothing to do with apples), and is promoted through elaborate websites, advertising, and in-store promotions. It may be sound in theory to manage supply to ensure high quality and prices, and the licensing fees are an innovative way to ensure that the varieties are given a fair chance in the marketplace. But the trend toward trademarking penalizes New England’s medium to small orchards, which to date have been excluded from joining the clubs or cannot afford them. In some cases the trademark is owned by a single company, such as Rainier Fruit Company in Washington state for Lady Alice, or controlled by a region or state, such as New York, where a growers cooperative this year released two new commercial varieties, SnapDragon and RubyFrost. None of these apples currently can be grown in New England. THE JURY IS OUT on the value of the trademarking trend, but ultimately its success will depend on the quality of the apple. To date , that means New England growers have little to worry about — these new apples add little besides novelty to the experience of eating an apple. Give me a tangy McIntosh or Cortland at any time of year over any of these new, overly sweet apples. Most of these new, trademarked varieties seem destined for the same fate as the many now rare or extinct apples discovered in New England in the 17th, 18th, and 19th centuries, for similar reasons. Most of the early heirlooms disappeared from the marketplace due to their mild, bland flavor. Perfectly good apples, they simply lacked distinction. Many of these varieties were esteemed more because they stored well rather than due to their flavor, and they gradually lost popularity or disappeared altogether with the advent of refrigeration. The new trademarked varieties to date have similarly undistinguished flavors (although too sweet rather than mild), and their repetitive firm textures, valuable for shipping and handling, adds little to their bland, sugary taste. I have nothing against a sweet apple (although I usually prefer one that’s got some tang or bite). But the sweet apples commonly grown in New England, like Honeycrisp, Gala, or Jonagold, retain some character, and still taste like apples. Many of the new, trademarked varieties are nothing but sweetness, generic as bubble gum or cotton candy. These apples are a novel choice to satisfy a sweet tooth, and healthier than a candy bar, of course , or a slice of cake. The best ones are not overly cloying, and some are at least juicy. But anyone looking for apple flavor is likely to be disappointed by most of these new entries. And they can’t be grown on New England soil. TWO OTHER NEW APPLES appearing in New England grocery stores for the first time this winter are the first U.S. Department of Agriculture-approved genetically modified (GMO) apples, Arctic Granny and Arctic Golden. Like the trademarked apples above, Arctic Granny and Arctic Golden apples are not grown in New England. The two varieties, developed by Okanagan Specialty Fruits Inc., of Summerland, British Columbia, Canada, were developed to be “nonbrowning” to increase a sliced apple’s visual appeal when exposed to air, making them more attractive in uncooked foods like salads. The Arctic apples achieve this through the insertion in the apple’s DNA of polyphenol oxidase, a gene found in potatoes. The subject of GMOs remains controversial, and the USDA in 2013 and 2014 received thousands of responses during the public comment period on the petition to regulate Arctic apples. Baby food manufacturer Gerber announced in 2013 that it had no plans to use Arctic apples, and the fast-food restaurant chain McDonald’s soon followed suit. While Arctic apples “are unlikely” to pose a plant risk to agriculture and other plants, according to the USDA’s February 13 announcement of their approval, apple industry leaders have been concerned about the Arctic’s potential to harm consumer perception of their fruit. 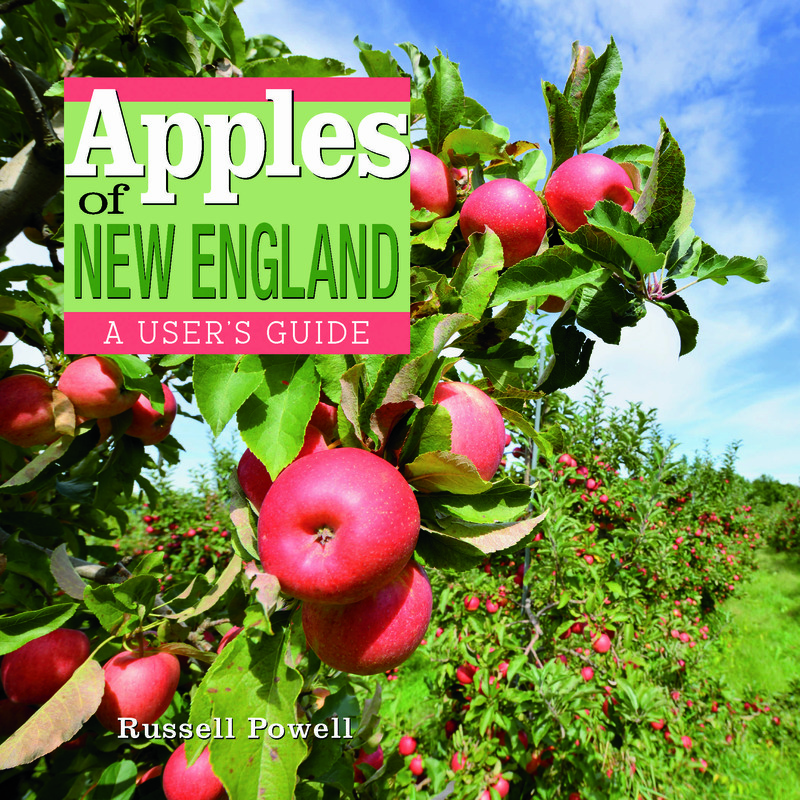 TO LEARN MORE about the history of apple growing in New England — including how to identify a trademarked from a locally grown apple — with photographs and descriptions of more than 200 varieties discovered, grown, or sold in the region, check out Apples Of New England (Countryman Press, 2014), by Russell Steven Powell, with photographs by Bar Lois Weeks.